Hi Dirk, a great post. I would add that sequence risk never goes away. This is a common myth, you didn't imply here, but some readers may be thinking it. You used a 30 year example - which is a starting point. One needs to remember we live in 4 dimensions - one being time. So after a year, the time period is 29 years, then after another it is 28 years, etc. Actually, the time remaining doesn't go down a full year when you refer to Period Life Tables (Social Security, Annuity, etc) to establish how long the distribution period should be. My point is, recognizing aging through those 30 years resets the time period. This is done in real life through annual reviews and updating the facts (portfolio balance, new time period, and portfolio characteristics for the calculations, etc). I dub this Dynamic Updating. Thus, the success or failure rates provide insight into what is a prudent withdrawal for income for the subsequent year. Reviewing this each year provides a new value for that year. Measuring and monitoring each year puts a rudder on the retirement income ship - instead of rafting without rudders viewing single simulations as static answers. Annual updating keeps you looking ahead a year at a time rather than referring back to anchor on past calculations. I'm sure your practice updates during reviews too. A great post dirk. This is a critical point I suspect a lot of people don't consider. 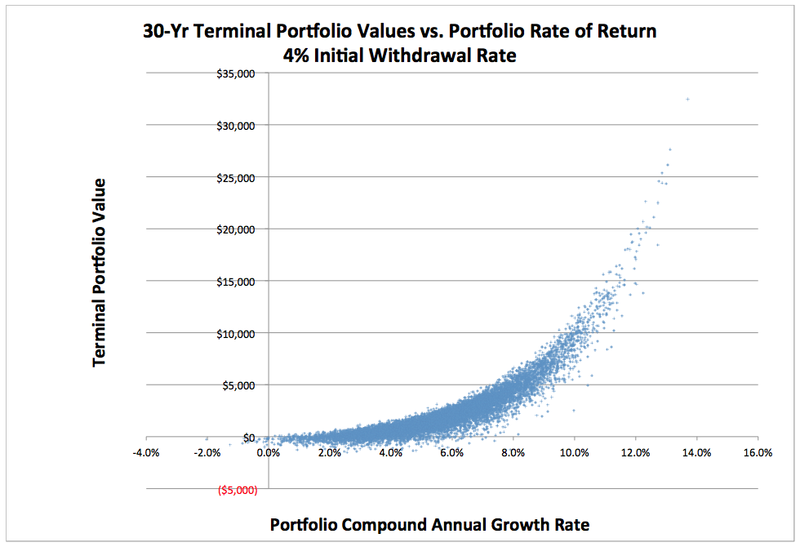 I think it's why people believe you can withdraw a fixed amount from a retirement portfolio throughout retirement with no effect your prior risk estimate. Every year, important things change: your life expectancy, your portfolio value, your spending, a dozen other things and yes, your "sustainable withdrawal rate". Your retirement plan has to change to reflect all that. Probably deserves an entire post. Thanks for adding that, Larry! Hi Dirk, good post. I've seen where Wade and others have said you may need to withdraw less than 4% in the future to be safe. Would 3% change the results much? After my next post, people are going to think I pay you to write teasers. I haven't finished the analysis, but here's another teaser. It may not be what you expect, but it is probably what you should expect. Dirk, I an sufficiently intrigued now. Can't wait until your next blog post. One other question. Assuming that the best time to purchase a TIPS ladder or SPIA for guaranteed income is in your late 60s or early 70s (or at least much later than my current age of about 60) then I had assumed as an early retiree I would use a constant percentage (say 3%) systematic withdrawal from my conservative stock/bond allocation (maybe 30% stock/70% bonds) until that time (if my portfolio value went down so would my income). What other choice does an early retiree have? Thanks, Brad. Actually, it's looking like that will be the post after next. I personally believe there are good reasons to postpone buying a SPIA to about age 70. If for no other reason, it keeps your options open longer. I think that's the sweet spot for price, but that's hard to prove. There is no incentive to postpone a TIPS ladder, though, except current interest rates being so low. I can't predict rates; no one can. (They fell again recently? How is that even possible??) But I'd rather be in a short duration bond fund right now than a TIPS ladder and that would be the alternative to portfolio spending for a conservative investor like yourself. If you're not worried about inflation (I'm not, but see my interest rates caveat above) look at other Treasuries or even muni's if they make sense for your tax rate. And watch the expense ratio. Dirk, I don't know if it would be the right time but, when you discuss SPIA's in that coming post, perhaps you might discuss the relatively new possibility to purchase deferred annuities within an IRA as an alternative. And thanks for all the good "food for thought". I will, but I have three or four posts queued up ahead of it. Thanks! If 80 -90% of the danger of "early loss risk" and "SOR risk" is in the first 10 years of retirement. And if you can almost eliminate that risk by holding 10 years (or even 15 years) of fixed annuities, TIPS ladder (and presumably I Bonds, CD ladders, Stable Value funds, Short Term treasuries) and you are willing to not touch your stock portfolio for 10 (or 15) years ("buy and hold") if stock markets are down. If all that: why not hold say 50% stocks at retirement if the other 50% will last us for 10 (or 15) years without having to touch stock? Do we really need to do 30% stocks at retirement (increasing by 2% pa for 15 years) as Pfau and Kitches current research is suggesting. Is their suggestion only of value for those who are using a SWR constant spending approach, withdrawing from a volatile stock bond portfolio? Why did you seem to regret (in a previous post) holding 40% stock at retirement. Surely your 60% fixed income would have got you through 10 or 15 years without touching your stock portfolio? I understand there is no guarantee that a stock portfolio with have recovered in 10( or 15 )years, but maybe the backup plan is to then, at that point, spend a constant % of remaining portfolio . value. Is it necessary to do a "constant %" from the beginning of retirement if you have a non volatile "bucket" to last 10 (or 15) years? I can see a Guyton type approach of not taking inflation adjustments in years when stocks are down to make ones "safe" bucket last longer : "just in case". But is a "constant % " approach necessary unless the "safe" bucket is getting really low and stocks are far from recovering? Or am I missing some important perspectives? Is it to do with Larrys comment that SOR risk never goes away? Is there a problem with just spending down a risk free portfolio if stock are down other than the behavioral one that you might be tempted to sell stocks when ones portfolio got up to 80% stocks as you used up your fixed portfolio while waiting for your stocks to recover from an early loss? I ask because that sort of strategy seems to make sense to me to overcome "early loss risk" and "SOR" risk but it doesnt seem to have many advocates: which suggests I am missing something, but I am not sure what that is.. What is the best strategy for minimizing "SOR risk" and "early loss risk" (without introducing other potentially more harmful risks)? Looking forward to your reply either here or maybe you are planning to address some of it in your next post. thanks so much Dirk. OK, I’ll try to respond to your questions within the limits of reply lengths. The risk of portfolio failure over 30 years is concentrated in the first ten years, but SOR risk doesn’t go away after 10 years. It’s exponential. It just becomes concentrated in about the first third of your remaining years in retirement. If all that: why not hold say 50% stocks at retirement. . .
That would be fine if you can tolerate a 20%+ loss in a bear market and not be tempted to sell, and don’t have a financial crisis of some other kind that would force you to sell at low prices (selling isn’t always a choice). Do we need 30% stocks as Pfau and Kitces recommend for early retirement? I recommend 40%, and 30% isn’t that different. Is their suggestion only of value for those who are using a SWR constant spending approach? I wouldn’t think so. The information is also valuable to investors in the decade before retirement. The idea is that, if you own stocks, you need to be especially careful with them the decade before and the decade after retirement. These are critical times but for different reasons. They also recommend high stock allocations late in life, which I don’t have a huge problem with, except that most people won’t live long enough to take advantage of them. Why did you seem to regret (in a previous post) holding 40% stock at retirement. I regret holding a lot of stock when I first retired because I didn’t need the risk I was taking. To quote w. Bernstein, “when you win the game, stop playing.” Fortunately, I had plenty of margin. Is it necessary to do a "constant %" from the beginning of retirement if you have a non volatile "bucket" to last 10 (or 15) years? As opposed to what? The only strategy to avoid SOR risk (”early loss risk” is a result of SOR risk) is to avoid spending from a volatile portfolio. You can minimize it with a lower withdrawal rate. Spending a percentage of remaining portfolio value is less risky than spending a constant amount. Any time you reduce or avoid selling stocks, you will reduce SOR risk a bit. Hope that helps. Thanks for writing! Your posts on sequence of returns risk have been very helpful to me as I formulate an Investment Policy Statement for myself. I am in a position where I do not *need* to take much risk, so I have figured out a way that insulates me from needing to worry about it. Because I am new to the brave new world of investing, I am starting out with a very conservative 20% in equity and will plan NOT to rebalance but just to take all my withdrawals from the fixed income side (which is mostly in TIPS or an company stable value fund currently paying more than inflation.) With SS and a small pension, I can see a 1% withdrawal rate as more than covering basic needs and 2% allows for extras. I would plan to take these withdrawals all out of the fixed income side of my portfolio. That allows me to just stay in a "Buy and Hold" mode for my equities, which means that over time they are likely to gradually grow into more than their current 20% of my portfolio as I grow older, which is okay with me, because the longer I live, the fewer years I need to plan for (in expectation). I would not plan to sell any of my equities during my lifetime (though I might do opportunistic tax loss harvesting along the way and just switch them temporarily into a substantially different index mutual fund). And I might occasionally and opportunistically give some appreciated equity assets to charity along the way or use them as personal gifts to recipients who have lower incomes and thus would pay 0% tax on them. This way I don't need to worry about sequence of returns and can just stay philosophical about whatever the market does. Anyone who can spend 2% or less of their savings portfolio has pretty much "won the game". Yours sounds like an excellent strategy. Congratulations! And thanks for writing. While I agree that the annual return on your portfolio is unpredictable, I do believe that the stock market valuation metrics tracked by Doug Short and others (including CAPE and GMO 7-yr estimated returns) are useful in identifying if below average, average, or above average returns are expected in the next decade. Similarly, the current interest rates contain a lot of similar information. As a result, I think today's SWR for a retiree would be much lower than in the 1980s. That could be the difference on using 3%, 4%, 5% or even 6% (feasible in 1982) SWR for planning. I think the concept of a fixed, universal SWR causes many of the planning problems for people as the SWR after a crash would generally be higher than before the crash (much of the risk was just taken out of the stock market) which would reduce some of the anxiety levels of people who just saw their portfolio get whacked. Having a more dynamic view of SWR may reduce some of the bad investor behavior that we see. I think you may be missing a key point. 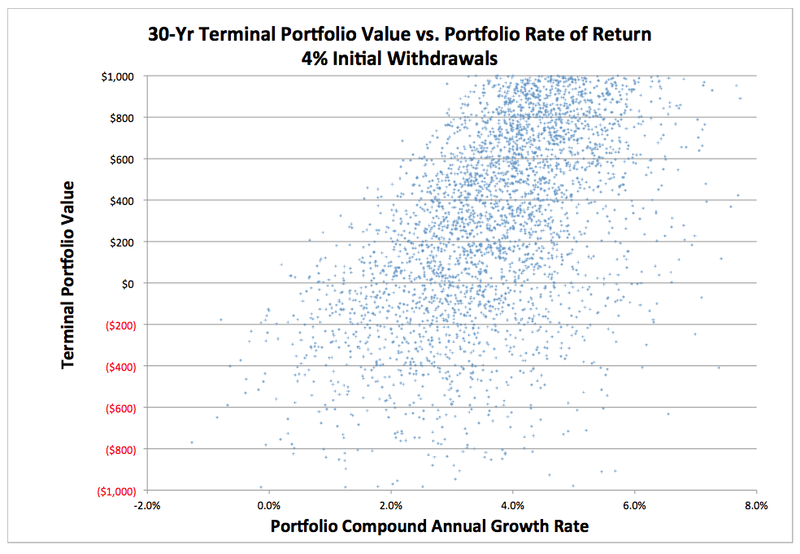 Even if we knew precisely what the average rate of return for our portfolio would be for the next 30 years, portfolio survivability is largely a factor of sequence of returns and there are no metrics to predict that. While it is true we can't predict the future, there is software that can predict what would be your particular outcome, given the worst 40 year period over the last 100 years. This is a great starting point over just guessing, or believing some useless Monte Carlo simulation, like you find on many websites. The worst outcome in the past 100 years is an interesting but unconvincing test. To base your retirement plan on it, you must assume that your own retirement won't experience something even worse. There is little convincing evidence that stock market returns in the future will look like past returns and convincing arguments from Pfau, Finke and Blanchett (SWR's may be closer to 3%) that they will be worse. Further, Pfau's study of foreign markets, which have not supported 4% withdrawals historically, suggests that 4% withdrawal rates, which are based on worst-case analyses, might well be an anomaly of U.S. history. So, maybe the market has shown us the worst it has to offer over the past 100 years, but I'm not willing to take that risk with my retirement. Thanks for writing! By the way, I want to add that I would strongly advise against spending more money from a retirement portfolio after a market crash based on your belief that the market will quickly recover. When you have less money, as you would after a crash, you should spend less, not more. If you guess wrong and the market doesn't recover quickly, spending more will significantly increase the probability of portfolio failure.